I totally get that kids' shows are meant to be educational. Useful lessons like 'don't run with sticks' and 'always brush your teeth' but as a mum, even I had to laugh when the first episode of the latest Peppa Pig DVD gave us Mr Potato's Christmas Show with 'everyone's favourite Christmas vegetable – Little Sprout'. Are they for real? My kids wouldn't even know what a sprout is. Kids just care about Santa at this time of year, so perhaps they were trying to score brownie points with parents. Maybe they were trying to be ironic. I found a lot of the humour in Peppa Pig went straight over the heads of the kids, who just enjoy the humble animation and simple storylines. For something so seemingly basic, they certainly manage to cram a lot of learning in to the short, five minute episodes including counting, basic physics and manners. All kids need useful lessons such as 'turn off your mobile phone when you go to the theatre', but I guess this is a new generation we're talking about. The Christmas Show DVD gives us ten new episodes including Pedro The Cowboy, The Flying Vet and Captain Daddy Dog. The title episode 'Mr Potato's Christmas Show' is the only festive episode on the DVD. Santa appears on stage and asks the kids: 'Have you all been good?' 'Yes!' they shout back. 'Have you all been cleaning your teeth?' he asks. 'Yes,' they all shout. 'Have you all been keeping your room tidy?' Santa asks. 'Uhhhh,' say the kids. Sounds exactly like my house, I thought (except for the teeth brushing bit). I particularly like it when British (or American) TV shows feel the need to have Australian characters. Their interpretation of the alleged Aussie accent is always good for a laugh, and having lived in three Australian states, I can put my hand on my heart and say I have never heard an Australian speak with the accent the British feel the need to attribute to us. So the 'Kylie Kangaroo' episode was very chuckle-worthy. 'Did I?' Daddy Pig replies in his prim Pommie accent. Unwanted visitors, what do you do? Have a BBQ of course. And when it looks like rain, the Kangaroo's profess: 'We love rain, we don't see much of it back 'ome.' Daddy Pig's response: 'Well, if you want to make it rain in this country, just have a BBQ'. Later Peppa encourages Kylie to show her friend how high she can jump. 'I don't want to show off,' responds our modest marsupial. Finally, a useful lesson, I thought. A lot more useful than having Peppa's father encourage all the kids to jump in muddy puddles. I know they are pigs, but really? Let's just have them all go out the back and play with matches. 'Lost Keys' is another episode I think I enjoyed as much as the kids. The Piggy family were at a picnic spot when Daddy Pigs says to little brother George 'You can't play with the car keys.' Peppa says to her dad 'But Daddy, you're playing with the car keys' to which he replies 'But I'm a grownup. I'm not going to lose them'. 'Yay,' the kids yell happily. At this point I began to wonder what sort of lessons Peppa Pig is actually teaching. The stick doesn't work, nor does a fishing rod. 'Now what do we do?' asks Peppa. 'Easy,' says Daddy Pig. 'We'll dig up the road.' 'Yay,' the kids yell happily. Because kids need to know that any problem can be solved with a few tonnes of heavy machinery. Or a stick. Luckily Mr Bull is there with his enormous crane and digs out the world's deepest drain. 'We came to see the beauty spot' say some visiting animals. 'It's now a cave,' says Daddy Pig proudly. 'Yay,' shout the kids. 'I love digging holes,' says Mr Bull. 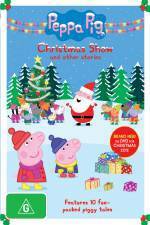 If your child is already a Peppa Pig fan, then they will love the new Christmas special. If they are new to the world of porcine adventure then this will be a fun way to be introduced. All the episodes are short and tend to finish rather abruptly. The music between episodes is distinctive – you'll either love it or hate it. My kids awarded it Four Muddy Puddles. DON'T WASTE YOUR MONEY! There was all this hype again about this dvd in 2016, it's still the same old dvd. Here's the thing...it has only ONE CHRISTMAS EPISODE.... The rest is all the same stuff you can just watch on Netflix or your on demand from cable provider. I was very dissatisfied. Learn from my mistake and just YouTube the one Christmas episode and SAVE MONEY.